(b) Using SST, connect terminals 13 (TC) and 4 (CG) of the DLC3. (d) Read and record any DTCs from the tire pressure warning light on the accessory meter. Refer to the illustration as examples of the normal system code and codes 13 and 23. If the tire pressure warning light does not indicate any DTCs or does not flash, inspect the tire pressure warning light circuit or TC and CG terminal circuit. 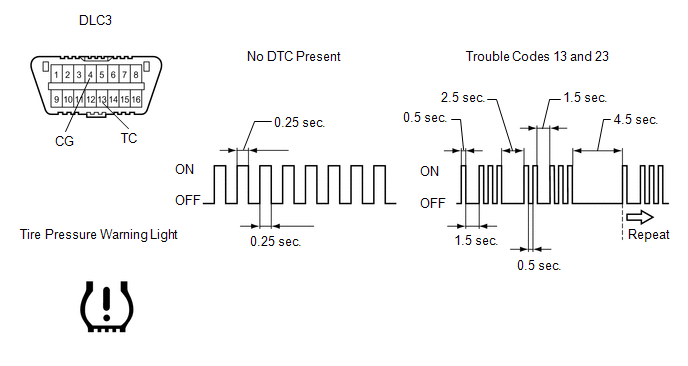 If 2 or more malfunctions are indicated at the same time, the lowest numbered DTC is displayed first. (e) Refer to the Diagnostic Trouble Code Chart for DTC information (See page ). (f) After completing the check, turn the ignition switch off and remove SST from the DLC3. (f) Read the DTCs following the prompts on the Techstream. Refer to the Techstream's operator's manual for further details. After repairing the malfunctions, clear the DTCs. (f) Clear the DTCs following the prompts on the Techstream.